Obv. ST.PATRICK. FOR.IERl[AND] A demi-figure of St. Patrick in cope and mitre holding patriarchal cross. 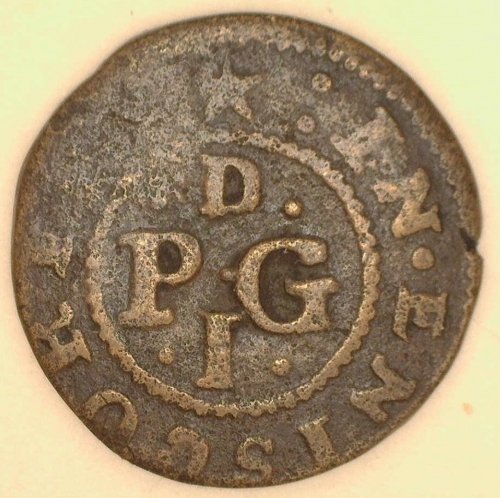 "Williamson , in his work, Trade Tokens issued in the 17th Century, records only one token depicting St. Patrick, which was issued by Richard Greenwood, a merchant of Dublin (W.333). Perhaps the initials P.G. on the new token stand for Patrick, or possibly Peter Greenwood, a relative of Richard Greenwood. A search through the Parish Registers at Enniscorthy could reveal the issuer's name, but because these tokens circulated for a long period, between 1653 and 1679, it would be extremely difficult to attribute an exact name to the piece. "The figure of St. Patrick on the token bears close resemblance to the money known as 'St. 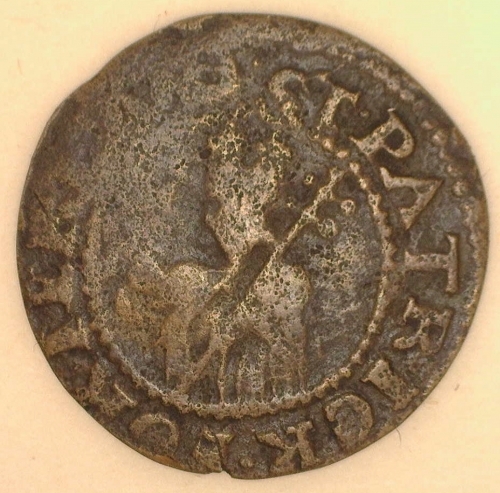 Patrick's' coinage, consisting mainly of farthings struck about 1674. It has been suggested that these were also a form of token. After they were called in about 1680/1, quantities were taken to New Jersey, U.S.A., by Mark Newby, a London tallow-chandler and Quaker. Through his influence they circulated officially as currency. "The issue of Trader's Tokens also came to an end in 1680/1, when Sir Thomas Armstrong and Colonel George Legg were granted a patent to coin larger and heavier regal halfpennies with the bust of Charles II, thus driving the tokens from circulation. "Unfortunately, the new token is undated, as it would have been interesting to have shown that these tokens with St.Patrick were issued either at the same time as, or prior to, the 'St. Patrick's' coinage referred to above."